Takeaway coffee cups might not seem like a marketing marvel on the surface, but they’re a great way to build awareness for your brand. At Pureco Packaging, we specialise in delivering custom-made coffee cups in bulk to hospitality companies around the world. Those organisations then use those cups to show off their unique style and create affinity with their target audience. As the ultimate way to get your name and logo out into the local streets, take away coffee cups are more than just a convenience. Here, we’re going to introduce the benefits of take away cups for marketing purposes and discuss how you can choose the right design for your brand. The current world is more chaotic and fast-paced than ever before. People are blocking ads and ignoring emails by sending them directly to their spam folder. That means that some companies – particularly local ventures, are beginning to rediscover all the benefits of promotional offline marketing. Today’s customer might not have enough time to watch an entire television advertisement or read a blog post. However, who doesn’t have the time to sit down and drink a delicious cup of coffee at the start of their day? With takeaway coffee cups, you can transform your customers into brand ambassadors without having to ask them to take any time out of their busy schedule. Simply carrying your cup in their hand is enough to make sure that your brand gets exposed to dozens, even hundreds of new eyes every day! In fact, your brand ambassadors offline can even help to build your market presence online, by snapping pictures of your coffee cups for their Instagram and other social media accounts. All you need to make do is ensure that your cup is attractive enough to be picture-worthy. Which Type of Cup Do You Need? Many distributors offer a range of different coffee cups to choose from, all with their own distinct benefits and functions. So, which will work best for your brand? The single wall coffee cup is generally the least expensive and most common type of disposable cup for a hospitality brand. These solutions are made using a single layer of paperboard, and they’re best suited to cold drinks that don’t require extra insulation. 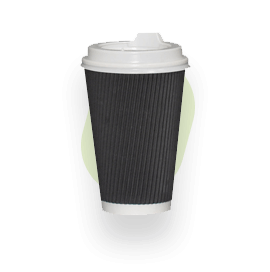 These options can be used with hot beverages, but they will require a branded sleeve to help your customer safely carry their cup around town. As the name might suggest, a double-wall structured takeaway coffee cup uses two layers of paperboard instead of one to give users as much protection and insulation as possible. By choosing a double-layer couple, you reduce the need for sleeves when serving customers hot drinks. This means that you can offer your users a better experience, without over-spending on accessories like sleeves. A ripple coffee cup offers a higher level of insulation than a double-wall coffee cup, because it’s designed to keep the heat inside the beverage container and away from your customers hands. The outer layering ripples of the cardboard also ensure that fingers can enjoy a better grip of the cup – this is particularly useful when customers are carrying more than one drink at a time. As brands around the world become more environmentally conscious, many companies are beginning to embrace coffee cup designs that are designed to be compostable, or recyclable. These cups are lined with PLA to make them reusable. This is great for brands who want to show off their sustainable side and attract customers who are environmentally conscious. Ready to make the most out of take away coffee cups? Contact the experts at Pureco China today! This entry was posted in Take Away Coffee Cups and tagged coffee cups, disposable coffee cups, reusable coffee cups, takeaway coffee cups, what are takeaway coffee cups made of.